TACOMA, WA--(Marketwire - October 13, 2010) - During the 14 years of available returns for the Russell Global Index there has been a similar correlation pattern between India and China with the U.S. broad-market Russell 3000® Index. Throughout the period, the Russell 3000 reflected an average 2-year correlation of 0.50 with the Russell India Index and 0.48 with the Russell China Index. 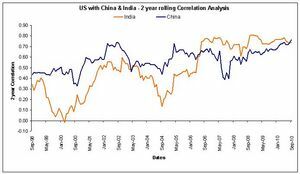 While the Russell China Index has correlated to the U.S. market at a relatively steady degree during the 14-year period from September of 1996 through September of 2010, staying within a range of 0.30 and 0.75, India's correlation to the Russell 3000 has increased more so since 2006, reaching a 0.80 correlation point in 2009. Indexes are unmanaged and cannot by invested in directly. Returns represent past performance, are not a guarantee of future performance, and are not indicative of any specific investment. Russell's publication of the Indexes or Index constituents in no way suggests or implies a representation or opinion by Russell as to the attractiveness of investing in a particular security. Inclusion of a security in an Index is not a promotion, sponsorship or endorsement of a security by Russell and Russell makes no representation, warranty or guarantee with respect to the performance of any security included in a Russell Index. Russell Investment Group is a Washington, USA corporation, which operates through subsidiaries worldwide, including Russell Investments, and is a subsidiary of The Northwestern Mutual Life Insurance Company.